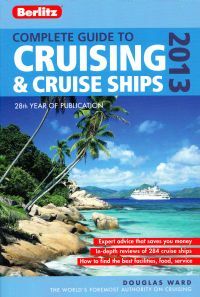 Now in its 28th year of publication the annual Berlitz Cruising and Cruise Ships has been published. Edited by the venerable Douglas Ward, even at its cover price of £17.99, the 704 pages (it seems to have got slightly slimmer this year) is terrific value covering 285 ships and offering a host of information. Such is the strength and longevity of the book it can well afford some criticism. For reasons best known to themselves Berlitz has decided to reduce the printed size of the point score for each ship. Previously this vital piece of information stood out clearly. You could see that Europa, of Hapag Llyod Cruises, topped the bill with 1852 points. At the bottom rung of the ladder, and offering a completely different product, at 743 points are a pair of National Geographic ships. Please Mr Publisher go back to the old style next time around. Having used the books over many years, and occasionally met its inventor, it is apparent that Mr Ward likes the finer things in life, restaurants, cabins and the facilities included. Perhaps the guide might take a more detailed look at what is on offer for the average client. One other gripe is what is actually offered for children. A vague review in some ships is offered. Some are clearly unsuitable for youngsters but even the up-market operations are not keen to turn away future fans who can be accommodated, at virtually no cost to the ship, and from our experience behave themselves. Silversea for instance brings on board youth coordinators staff during the school holiday periods. Does the ship look after youngsters during mealtimes, and also late at night? Are there extras to pay? What happens in a port? The book follows no real path. Cunard for instance cater for the younger element, but only gets one line. RCCL is family friendly and this is noted. On Tuesday 4 December the TV presenter and naturalist Miranda Krestovnikoff will name Voyages of Discovery’s newest ship mv Voyager at Portsmouth. She will then depart for her sell-out maiden voyage, an 18-day cruise to Barbados via La Coruna, Funchal, then across the Atlantic, followed by St Kitts, Antigua, and Martinique. Formerly the Alexander von Humboldt, and built in 1990 serving as Cunard’s Crown Monarch, the ship has just undergone a multi-million pound month-long refit at Portland. 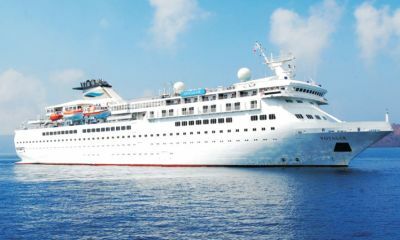 Voyager is part of the All Leisure Group Plc which includes the Swan Hellenic Minerva. If the upgrading of that ship is anything to go by (its Berlitz rating jumped from 1324 to 1,456 – 3-star to 4-star) clients will be very satisfied. Voyager has received major technical upgrades plus the addition of more cabins with balconies, creating extra comfort and space while still maintaining Voyages of Discovery’s renowned unique discovery cruising ethos. 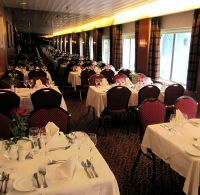 She offers a choice of 278 cabins, 30 of which have balconies and open seating dining. The Discovery Cruises package is aimed generally at the mature market who like the smaller ships and more educational style trips. High quality destination lectures are provided, there are no service or gratuity charges. Sterling is the on-board currency. Be prepared for a good selection of shore tours at prices considerably less than charged by other cruise operators. We will have to see how Berlitz rates Voyager but as things stand it is a slightly lower version of Minerva without the inclusive off-ship excursions. Key new additions to Voyager include the introduction of an explorer theme to the whole ship, the new Scott’s Lounge – a classic piano bar serving cocktails into the evening - and a speciality restaurant, the Explorer Club. Not dissimilar to the highly successful Orpheus Lounge on Minerva the new ‘Lookout’ lounge providing panoramic views from the front of the ship. Added to the Veranda Restaurant is a terrace with an all-weather awning added to allow guests to dine al fresco style. New artwork added to key public spaces. Upgrade of all soft furnishing in public spaces. Complete refurbishment of the library. New dual purpose Bridge Club which can also be used for Guest Speaker lectures and functions onboard the ship. American Cruise Lines was at World Travel Market promoting its river cruising products under the title "Discover America Cruise Collection." The collection offers an assortment of featured itinerary combinations and themes that showcase some of America’s most intriguing places, such as the American Heartland on the Mississippi River and the Wild West on the Columbia and Snake Rivers. The 2012 built Queen of the Mississippi looks like a 18th century stern wheeler but that is where the comparison stops. It even has complimentary wi-fi in every cabin. Milford Haven, which is about as far west as you can go in Wales, is expecting nine visits next year with many lines calling for the first time: Windstar Cruises (Wind Surf), Princess Cruises (Ocean Princess), Regent Seven Seas Cruises (Seven Seas Voyager), Saga and Holland America. This year the Welsh port was due to receive eight calls but severe weather conditions caused two to be cancelled. About 60% of passengers who came ashore were British. Pembrokeshire, where Milford Haven is situated, was voted second best coastal destination in the world through the National Geographic in 2011. The coastal path is popular with cruisers. Princess Cruises is gradually releasing details of the new Royal Princess which debuts next June. Passengers will find that two of the signature features have been enhanced to provide what is termed “the ultimate in relaxation”. Both the Sanctuary and the line’s popular adults-only pool will offer private cabanas for the first time. 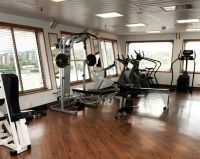 Silversea’s first ever ship, the highly successful boutique 296 passenger 6star Silver Cloud, – it really set the tongues wagging when first introduced in April 1994 – has emerged from an extensive top-to-bottom makeover. On the general front there is a modern colour palette not dissimilar to the much larger two-year-old Silver Spirit. The Pool Bar & Grill have been expanded and Le Champagne completely redesigned. The Fitness Centre has also been brought up to the very high standard of Spirit. The top suites have been outfitted with a new full-sized bathtub, and most Vista and Veranda Suites will also be modernised with the new rainforest showers, which will replace the current bathtub configuration.